IDF14 – Will Bare Metal Servers Obviate Bare Metal Switches? Recently I wrote about the Networking Field Day 8 presentations on Nuage Networks and Big Switch Networks. A noticeable absentee at Networking Field Day 8 was the co-host of the popular Packet Pushers show, Greg Ferro. What was so important that kept Mr. Ferro away from NFD8? Well, it turns out that he was attending Intel Developer Forum 2014 and discussed his findings on his show – The Network Break (I guess you can call me a Greg Ferro stalker). This prompted me to dig a bit deeper into Intel’s Software Defined Infrastructure vision and what I think it means to the networking industry. 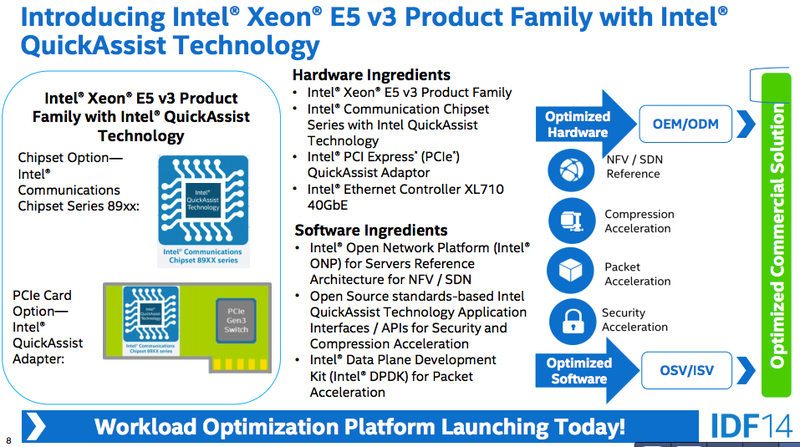 Intel’s announcements included new products such as the XL710 controller and E5 chipset, and technologies, such as QuickAssist Network Acceleration APIs and Data Plane Development Kit (DPDK). DPDK has actually been around since 2010. As defined on its website, it is a set of libraries and drivers for fast packet processing on x86 platforms. It runs mostly in Linux userland. This allows for higher levels of packet processing throughput than what is achievable using the standard Linux kernel network stack. In fact, according to these slides, it can achieve a 25X improvement in per core L3 packet performance over standard Linux. 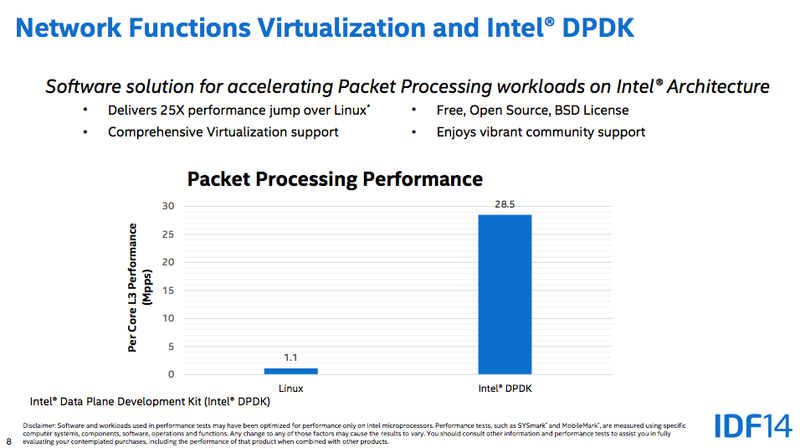 Using DPDK, the latest Intel chips can support Geneve, which is a highly extensible UDP encapsulation for overlays. Geneve claims to perform flexible packet matching of any type of tunnel protocol (such as VXLAN and NVGRE). Within the Geneve Header is an Options field that can contain metadata and context, which is invaluable for NFV & service chaining). So, it is not surprising that Intel has a partnership with VMware (the champions of overlay networks) that is catered to NFV solutions. 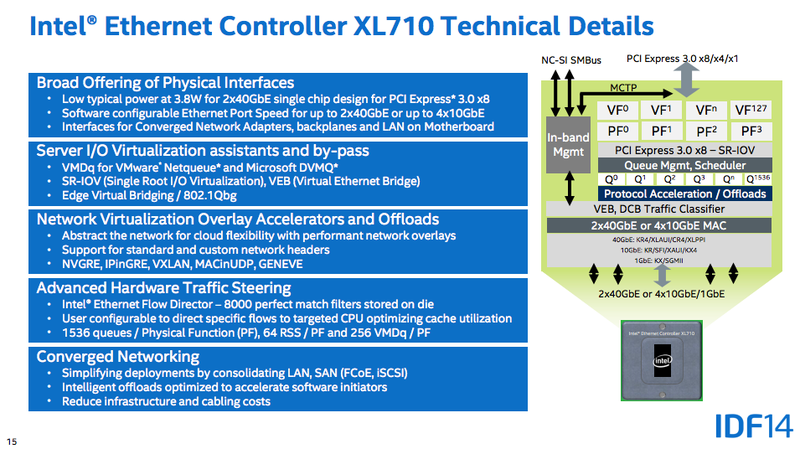 The Ethernet Controller XL710 is 40 Gbps ready on a single virtual core, 160 Gbps per CPU socket. It can terminate Geneve tunnels at line rate (39.39 Gbps on the 40 Gbps adapters) as the IDF14 demos showed. The reason it can do this is because of Receive Side Scaling for VXLAN, which balances CPU utilization across cores. Some of the packet/security/compression acceleration features of the E5-2600 v3 chipsets, powered by QuickAssist technology (which does stateless offload and protocol acceleration), are 100 Gbps SSL Termination (a boon for SEO), 160 Kops (key operations for IPSec), 80 Gbps Platform compression (applicable for Big Data analytics like Hadoop), which should keep pure play networking vendors (including firewall, VPN Concentrators, and load balancer) on their toes. The overlay vs underlay network debate has become a hot topic in recent years, perhaps best exemplified by the Cisco ACI vs VMware NSX solutions. VMware believes that overlays on top of bare metal servers running X86 chips are the way of the future. They believe that protocol offload technologies like QuickAssist are the solution for building scalable infrastructures. Pure play vendors like Cisco believe that there is still value in custom networking ASICs on switches that form the underlays. Still other networking startup vendors like Pica8, Cumulus Networks, and Big Switch Networks are the poster children of bare metal switches, i.e. switches that leverage merchant silicon, such as Broadcom or Marvell, and whose sheet metal is assembled by white box vendors such as Celestica, Delta Networks, Acton, or Quanta. How will Intel’s recent announcements affect networking vendors? Well, network virtualization poses very different challenges from server virtualization. Protocol offload has been around for several years, but isn’t as ubiquitous as you’d think: I ran into performance issues first hand with TCP offload in 2011 when disabling it used to give much better results. And simply slapping an overlay on top doesn’t solve every networking problem. Scaling in network virtualization is far more difficult than scaling in server virtualization. For example, the number of ACLs needed grows quadratically as the number of web servers or database servers increases linearly. I think the future is still bright for bare metal switch vendors, but I would love to hear back from you.